Mary is from Taranto, Italy. 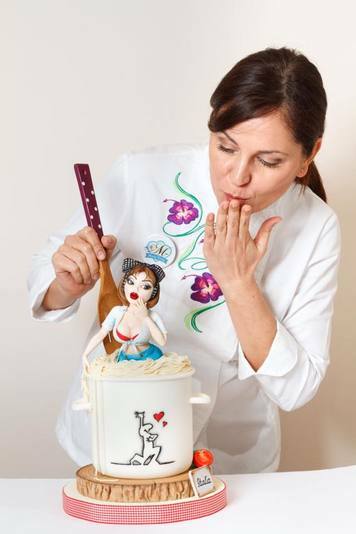 She is world-famous for her ability to create sugar paste masterpieces using just her hands. When she started her journey in our sweet world she never imagined that "sugar paste" would end up taking her all over the world: the Netherlands, Germany, France, Great Britain, Spain, Peru, Ecuador, Mexico and Hong Kong... she's taught in them all! Now she's coming to Australia. Maybe she's developed her artistic talent through her previous study in fashion, or maybe it's in her genes. She comes from a long line of confectioners. There's no one better in that field than the Italians! In this fun filled sugar modeling workshop, you'll recreate Mary's super cute 15cm Marilyn Monroe cake topper which you'll place on top of a covered 4" covered polystyrene cake. Mary will teach you about her favourite products and tools (she improvises a lot!). She will show you basic techniques step by step. You'll learn how to create caricature features, how to make a correctly proportioned torso and arms, hands and hair. She will teach you the process she goes through whenever she designs and creates her unimaginable sugar art. To finish your devine Marilyn Mary will teach you how to paint facial features and to make her strapless swim suit. Investing in this workshop will take your skills to an amazing new level. Good news too..... if you have a cake decorating business (big or small), all workshops are classified as training and are tax deductible.